It’s hard to imagine, but every single scripted television show got upstaged by Big Bird this week. I know, it boggles the mind. Still, there were some pretty interesting moments for fans of great drama – including the last ‘Grey’s Anatomy’ episode I will watch until the finale (or I’m sick and Lifetime has a marathon). 5. Private Practice: This show is maudlin – a lot. Still, Violet’s pot party with Cooper in the bathtub at Pete’s funeral was fun to watch. Amy Brenneman is one of the best actors in prime time, and she has really had a chance to shine in this story. Violet’s freak out because Pete wanted a party instead of a funeral was spot on. I also couldn’t help but laugh at Charlotte’s reaction to Cooper proposing they take Lucas in the case that something ever happens to Violet. Am I alone in thinking Charlotte giving birth to a “litter” is going to be hilarious? Still, the most poignant moment was shared between Violet and Mason on the deck, when Mason informs her that his mom will introduce Pete to his grandma. It was like, finally, someone knew what to say to Violet to make her feel better. 4. Revolution: Each episode of this show gets better and better. NBC has ordered a full 22 episodes, so I’m hopeful this will relieve some of the tension on the show runners. ‘Revolution’ has a great premise, but there are a few pacing problems. Billy Burke’s Miles continues to be the heart and soul of the show – although I have high hopes for Elizabeth Mitchell (if they’d give her more air time). This week, through a series of flashbacks and painful revelations, we find out that Miles is the one that actually trained and set up the militia. While it is apparent Miles set up the militia as a way to combat lawlessness, he clearly doesn’t like what it’s turned in to. You’re not alone, Miles. 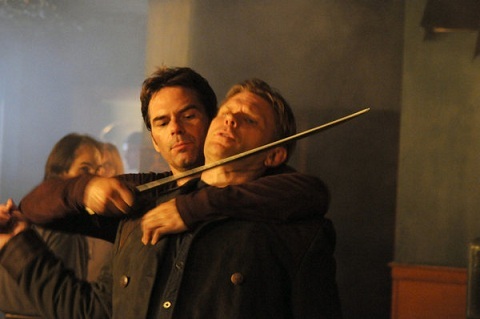 Still, nice touch adding Lucifer from Eric Kripke's former show, 'Supernatural,' also known as Mark Pellegrino. Pellegrino was also Jacob on JJ Abrams' former show 'Lost.' Nice symmetry boys. 3. 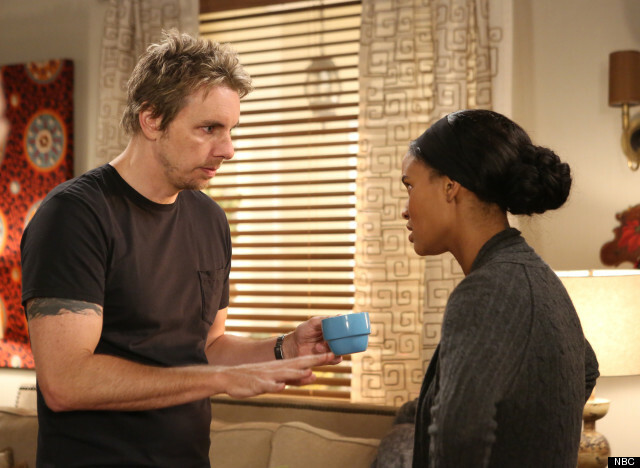 Parenthood: Jabbar accidentally hears the N-word while at work with Crosby – and Crosby’s explanations about what the word means don’t exactly sit well with Jasmine. She sits Jabbar down and explains about slavery and racism, all the while never going above his level of understanding or sugarcoating events. When she tells Jabbar that things will only get better for him, too, there is a feeling of genuine hope emanating from the young boy. I also enjoyed Max running for president of his class – and Kristina struggling with her own health decisions and doing what’s right for her troubled son. 2. Grey’s Anatomy: In general, I thought the episode was a dud. I was under the impression that we would get more of a feel of what happened at the plane crash site. Instead, we basically pick things up with the doctors being rescued. I was disinterested in Meredith and Derek and bored with Arizona and Mark. So how did ‘Grey’s Anatomy’ make the list? There was one extremely powerful scene, where Christina explains to Owen what she went through after the crash. She tells him about staying up for four days straight. She tells him about drinking her own urine. She tells him about struggling to keep bugs out of Arizona’s leg wounds. She tells him about the animals noises and how she thought they were coming for her – until she realized they’d come to scavenge Lexie’s body. That one scene was so powerful it should garner Sandra Oh an Emmy nomination. 1. 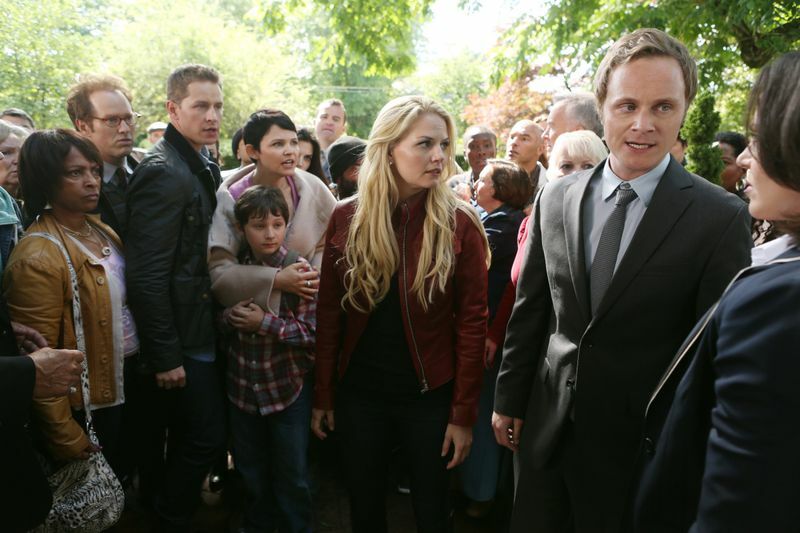 Once Upon a Time: Emma is reunited with her parents – but is it a happy reunion? Not so much. Emma says she’s happy to have found them but she’s still bitter about being abandoned. When Snow tries to explain that they were trying to give her the best chance they could, Emma remains distant. I think it’s going to be a long bonding process between mother and daughter. I especially liked Charming warning Snow not to push Emma – and Snow not being able to help herself. Henry calling Charming “grandpa” was also adorable. 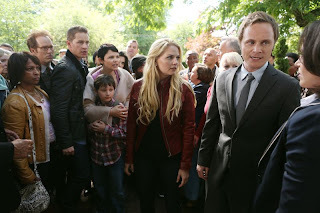 Still, while I was glad the premiere was action-packed, I would have liked a little more bonding with the family before Emma and Snow were sent to another dimension and Charming was left to raise Henry as a single grandfather. 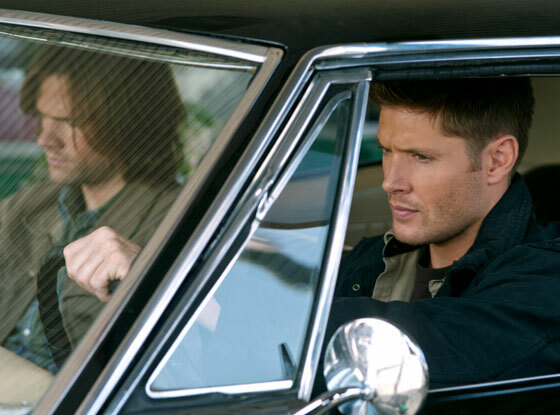 Supernatural: The opening episode was pretty much of a dud. Still, the Winchester brothers looked as good as ever and prophet Kevin had the line of the night when he informed his former girlfriend that not only had she been possessed by a demon – but she was also going to her safety school. Hawaii Five-0: In what is mostly a ho-hum episode, Steve finds out his mother never left the island (even though he saw her get in a plane). This was after Ed Asner’s evil character stepped in front of bus rather than returning to jail. Still, neither of those were my favorite moments. I liked the opening scenes of the crew surfing out for a memorial service for Chin’s wife. The camera work was breathtaking. Last Resort: It is increasingly looking like this show is going to get cancelled sooner – rather than later. So enjoy it while you can. My favorite moment of the week came when Daniel Lissing’s James King came to the rescue of his boat mates when they were taking on a rogue Russian team that was trying to steal the sub. He really is the one bright spot on this show right now. Switched at Birth: These last handful of episodes from the first season have been pretty slow. I’m fairly annoyed how quickly all the domestic issues have been handled – and Daphne jumps from love interest to love interest like she’s a Kardashian. Still, despite the fact that he cheated on her, I’m holding out hope for Bay and Emmett. This week, Bay stole the show, though when she informed her mothers that she had no intention of quitting her “street art” career. 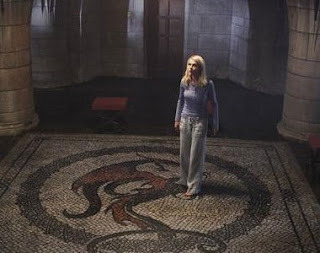 666 Park Avenue: The premiere wasn’t perfect – but it had promise. Terry O’Quinn is always awesome and Vanessa Williams is at her, um, witchy best. I like the mood lighting. I like most of the casting. I think it was a good set-up episode. I hope the show runners just don’t “Disney” things up too much and ruin it.